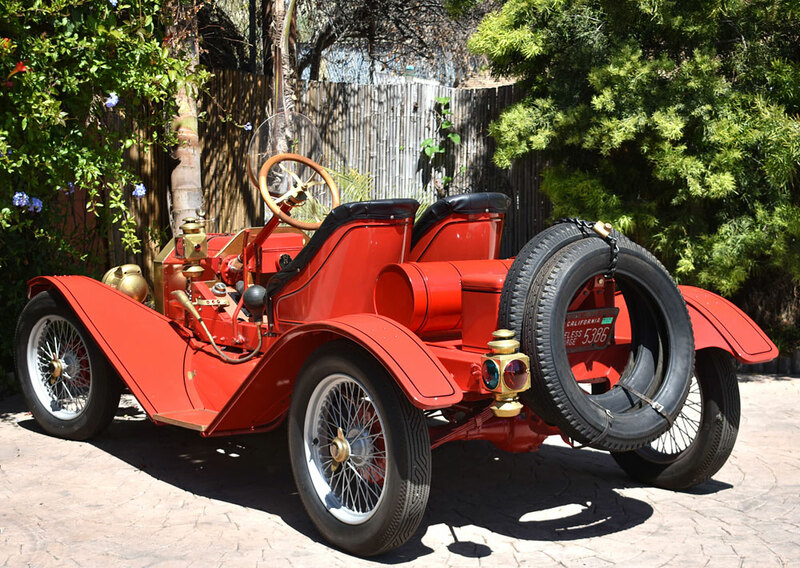 A 1915 Ford Model T Speedster, SOLD by Californiaclassix.com! Please wait a few moments while our high-resolution photo loads. We've been Model T fans for longer than we care to remember. The only issue we have with driving them in today's dense traffic is the lack of braking power, given that they do not have any wheel brakes. 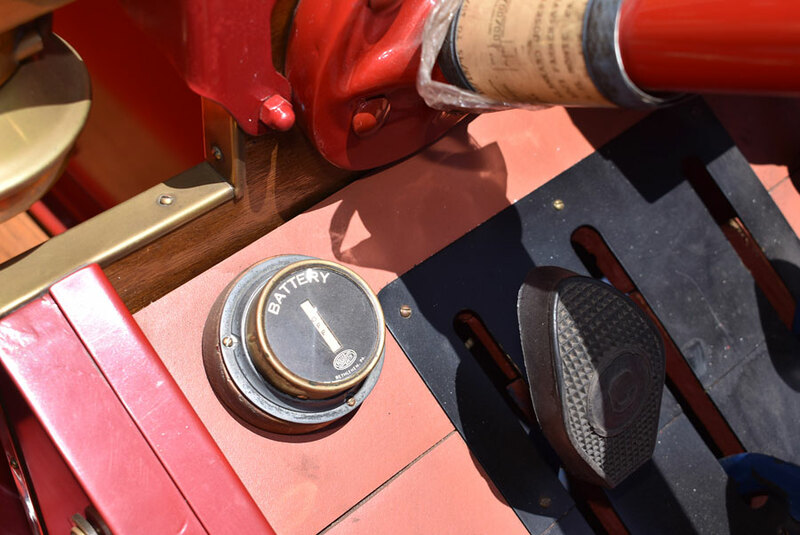 The only device slowing down a Model T is a small brake band -- often with wood lining -- inside the planetary transmission. Not so on this one! Featuring many meaningful updates, this car stops on the dime! Mouse Over the Photo to Enlarge. 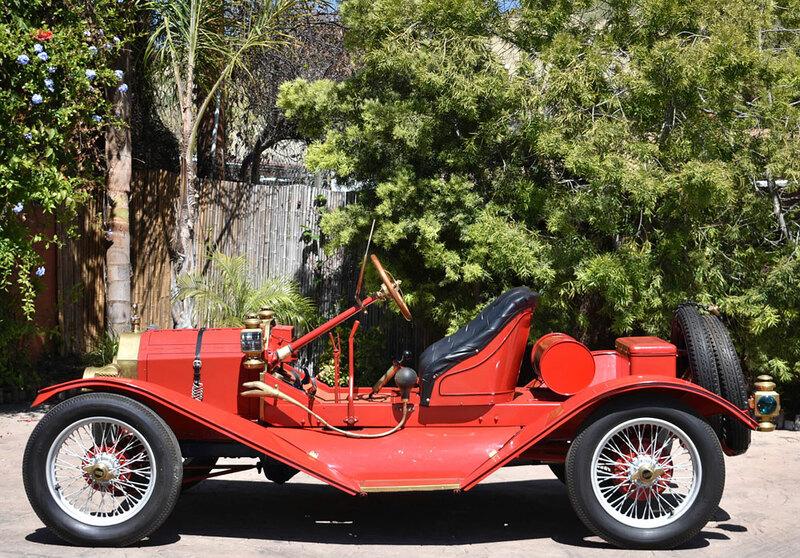 Not including the purchase of this Brass Speedster, over $25,000 has been invested on a fresh restoration that initially stalled in 1996 due to the elderly owner's illness. We've completed the build over a period of more than a year, thoroughly sorted the car, and now it's fully ready to be enjoyed. 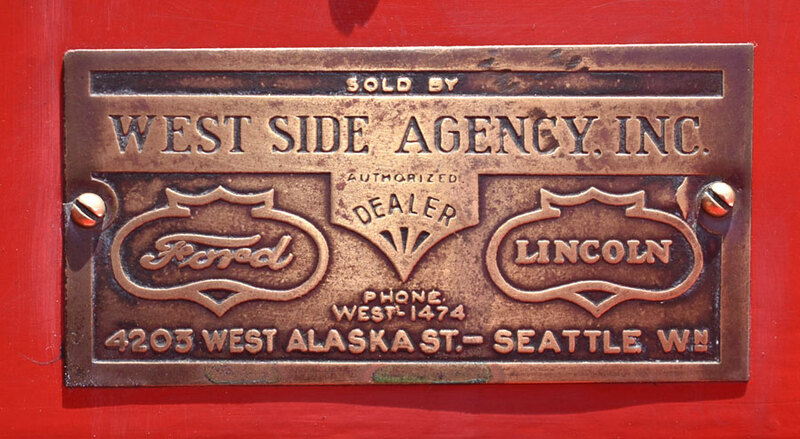 Have you ever seen an original brass plate from the selling dealer of a 100+ year old car? Neither have we, so that's a first for us as well! 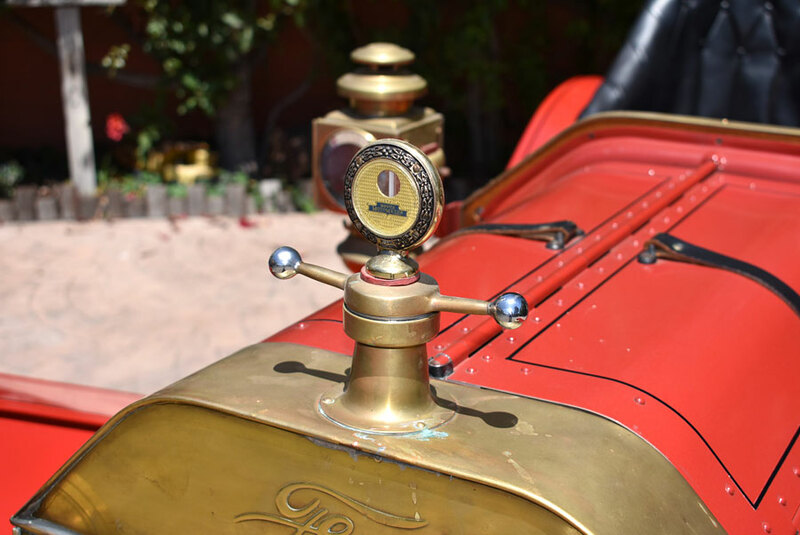 1915 was the last year for the brass Model T. In an attempt to save money, Henry Ford had step-by-step moved to black as the only color that was available, reducing brightwork in the process. The little "bling" that was left, was nickel plated steel instead of solid brass, simply because it was a great deal cheaper. Value-wise, there's an ocean between a brass T (1909-1915) and a black one (1916-1927). 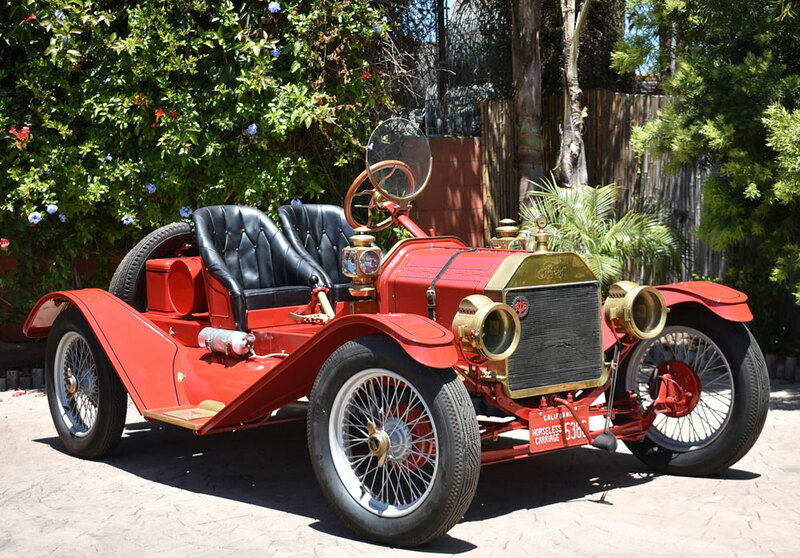 Following in the footsteps of the 1911/'12 Mercer Raceabout, this Ford Model T Speedster features a lowered chassis, 19-inch wire wheels, and hydraulic 4-wheel brakes! Since cooling circulation is provided by Ford's ingenious syphon system (hot water travels up in the engine, cools down in the radiator, then from the bottom of the engine up again), there's no waterpump. The Motometer cooland thermometer with bone base -- in brass no less -- is pure luxury! Genuine Ford Model 666 gas headlights are in superb state of preservation. They are fed via an acetylene tank that's mounted to the right of the passenger seat. 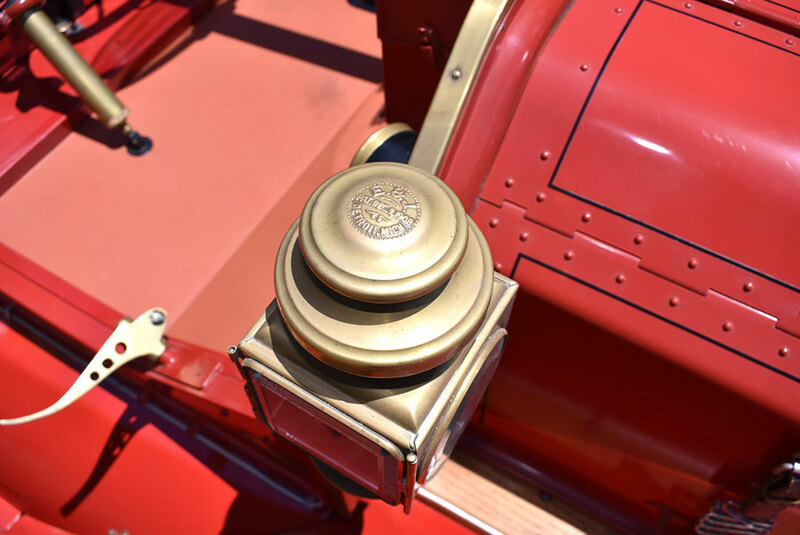 An item related to the railroad trains, the Kerosine-burning jeweled coach lights as well as the single taillight have different colors on the sides. A treat of the special kind is the solid brass serpent horn. It's in superb condition, as is the rubber bulb, and it'll wake up the sleeping dead! 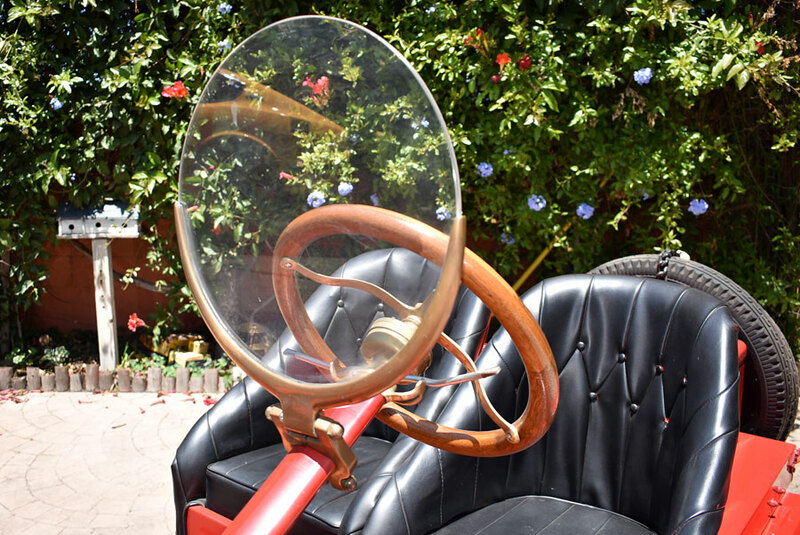 Another item mounted in solid brass: the monocle windshield. It folds up and down easily. Also note the brass foot rest. 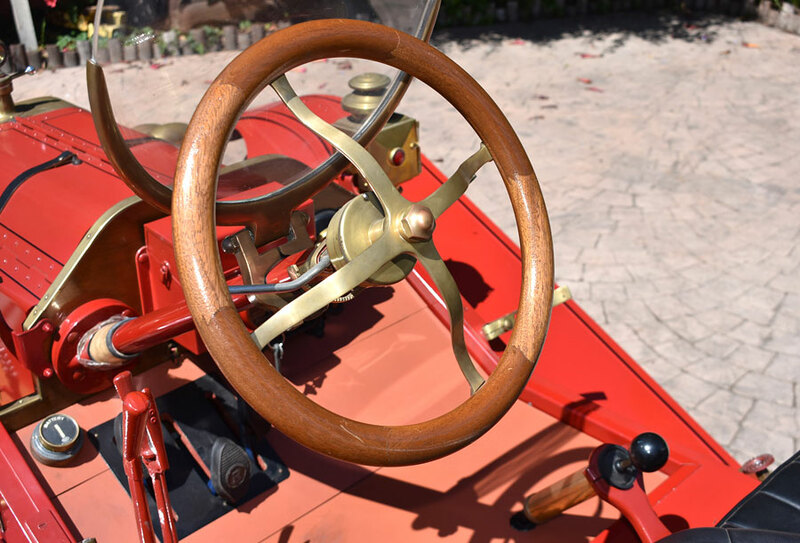 Solid brass-and-wood steering wheel still contains the levers for spark advance and throttle. 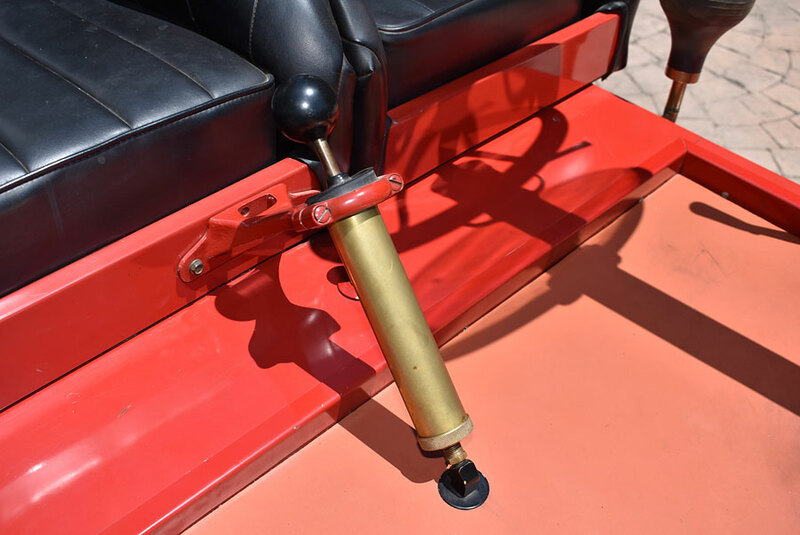 Luckily, the installed distributor ignition with automatic spark advance elimninates the need to do this manually, the gas pedal replaces the hand throttle, and -- most exciting -- the electric starter eliminates the need to hand-crank the motor into life, something that in colder climates has always been a challenge, even for athletes. 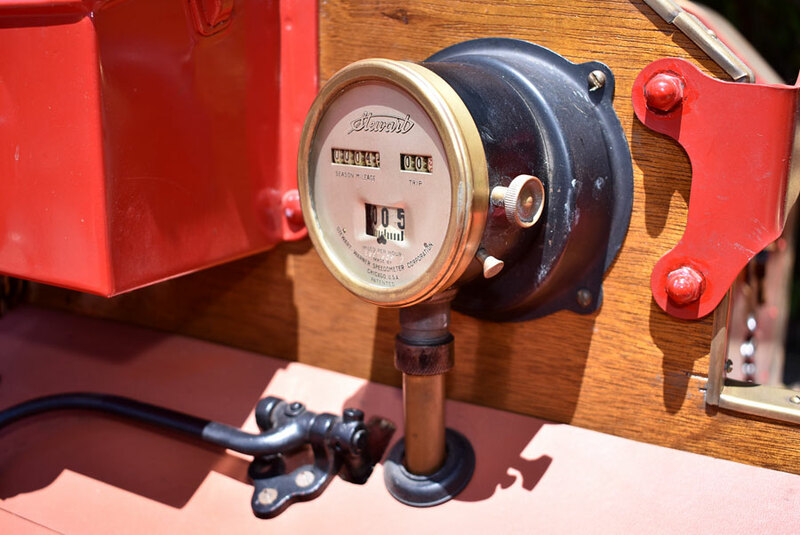 Another rarity: the Roller Smith ammeter, made in Bethlehem, PA over 100 years ago. If somebody asked you to build him the ultimate Speedster -- money being no object -- there's little you could do better than has been done here. 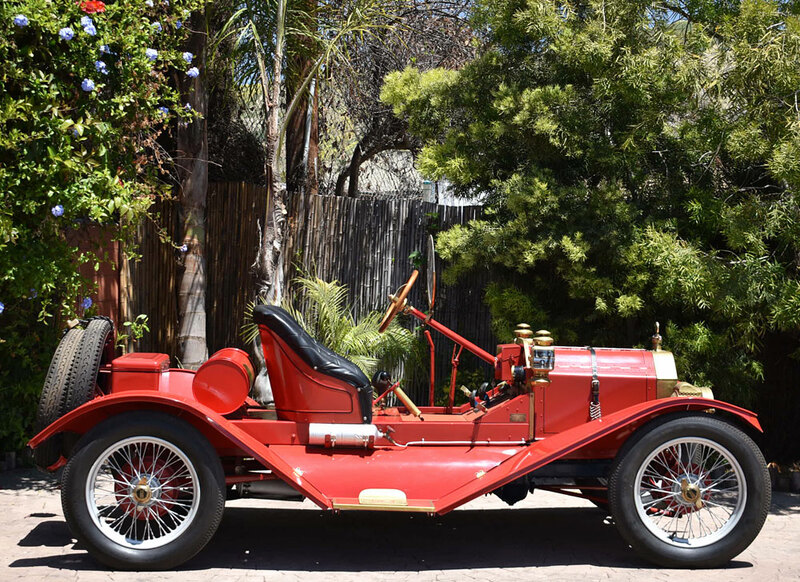 This car has everything money can buy, save for an OHC head, such as a Rajo, Frontenac, or Roof. This is one of the finest Speedsters out there! 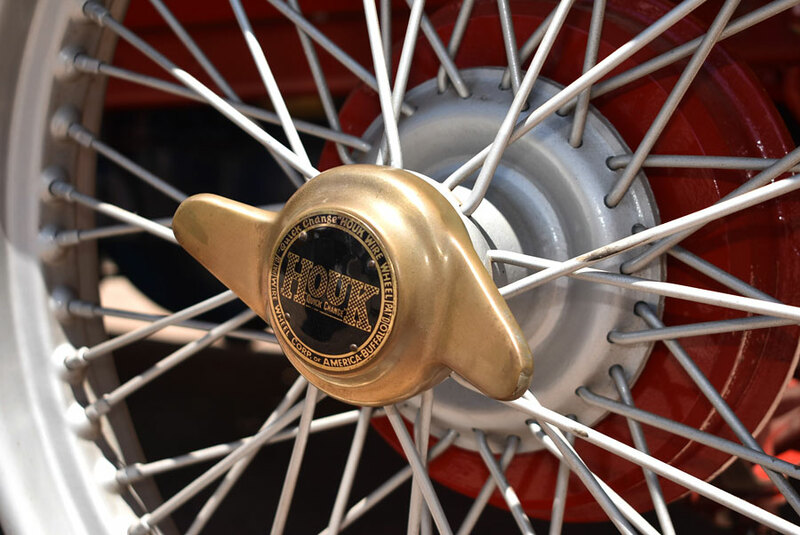 Continuing our inspection, we awe at the spoke wheels with solid Houk brass knockoffs. Price? If you have to ask . 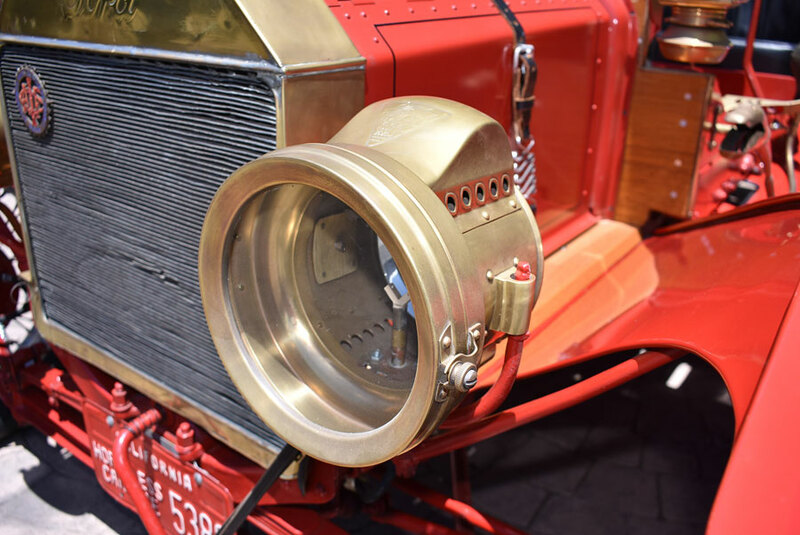 . .
A birdseye view of the E&J coach light, patented in 1908! 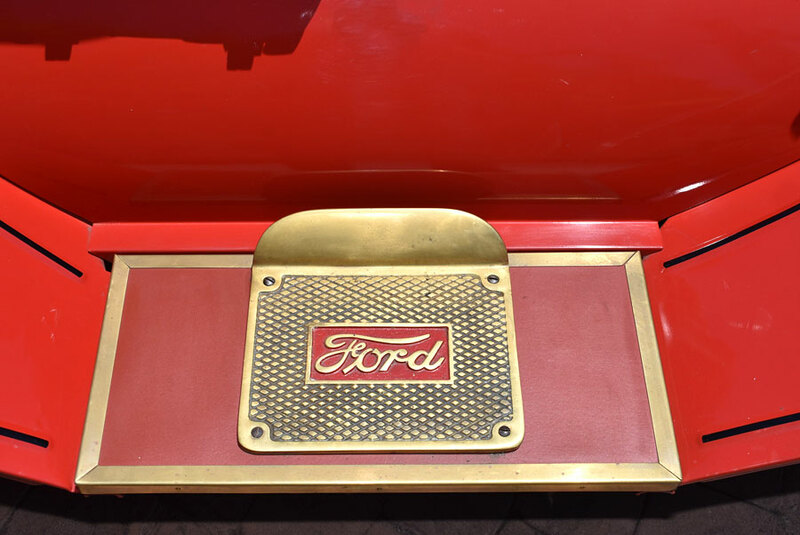 Genuine Linoleum running board insert with solid brass step plate. Stewart speedometer with odometer and tripmeter! 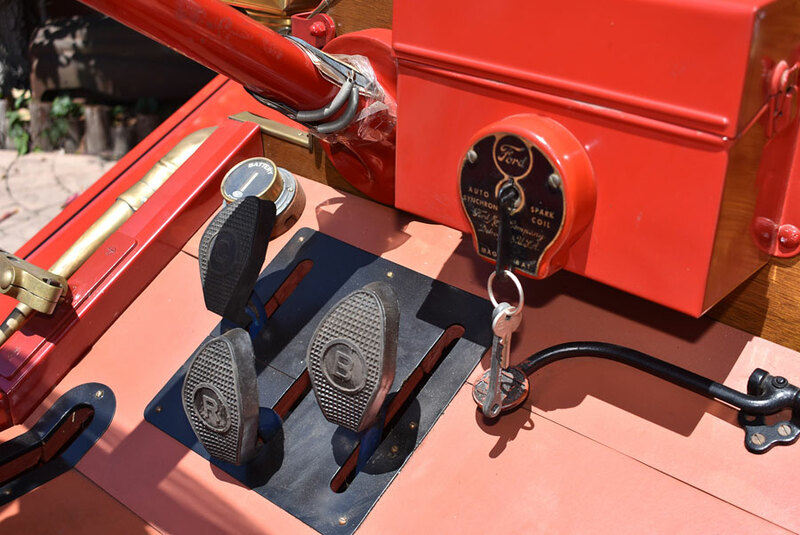 Pedals that make the uninitiated wonder how in the world a Model T operates. Right of the driver, is the manual fuel pump. Model Ts do not have any fuel pump from the factory. The fuel is delivered from the tank by means of gravity. 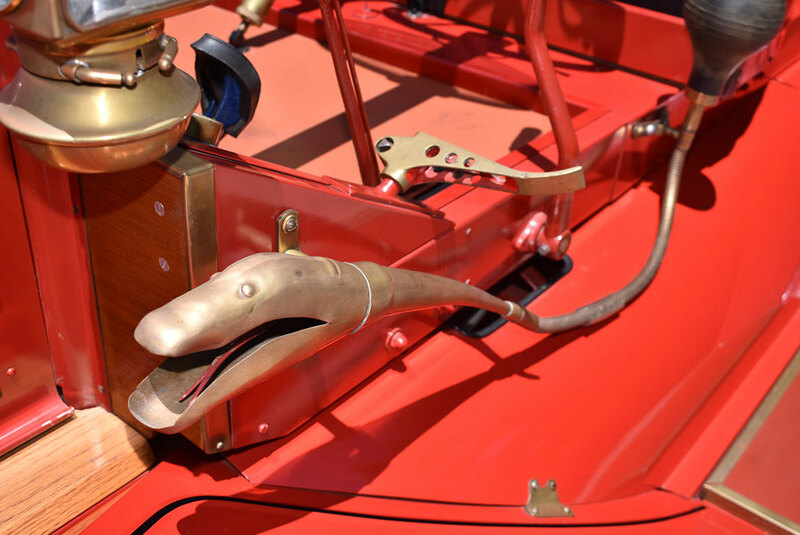 In competition, that may not be sufficient, which is why race cars from the early 1900s often have an auxillary hand pump. 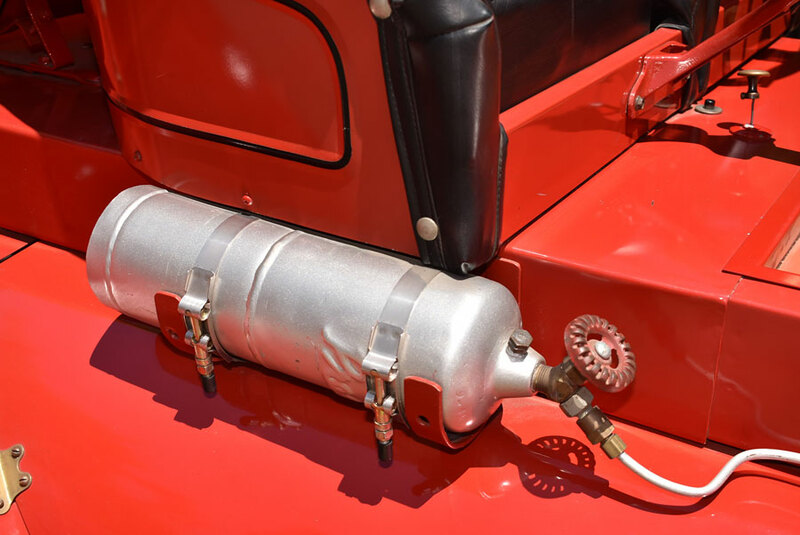 To the right of the passenger is the acetylene pump installed. It delivers the gas to the two headlights. 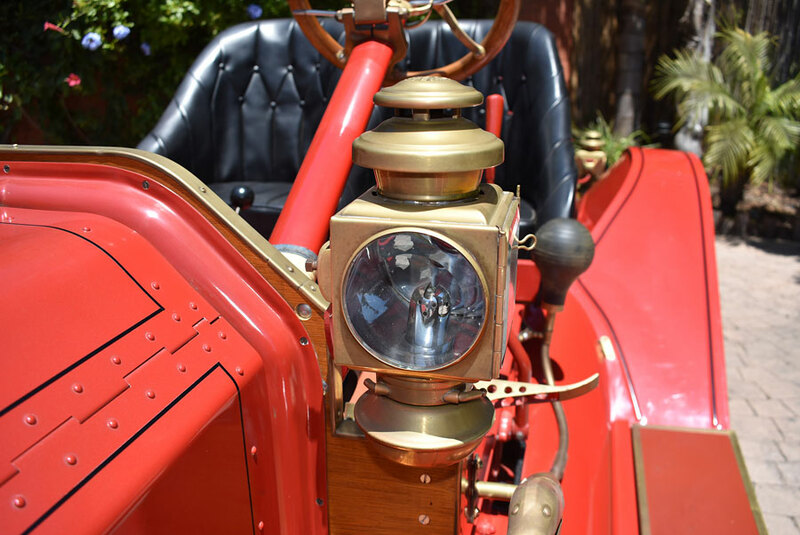 Also from the railroad derives the Kerosine-fueled, jeweled E&J taillight, featuring a red lens to the back, a clear lens to the right, and a green lens to the outside. 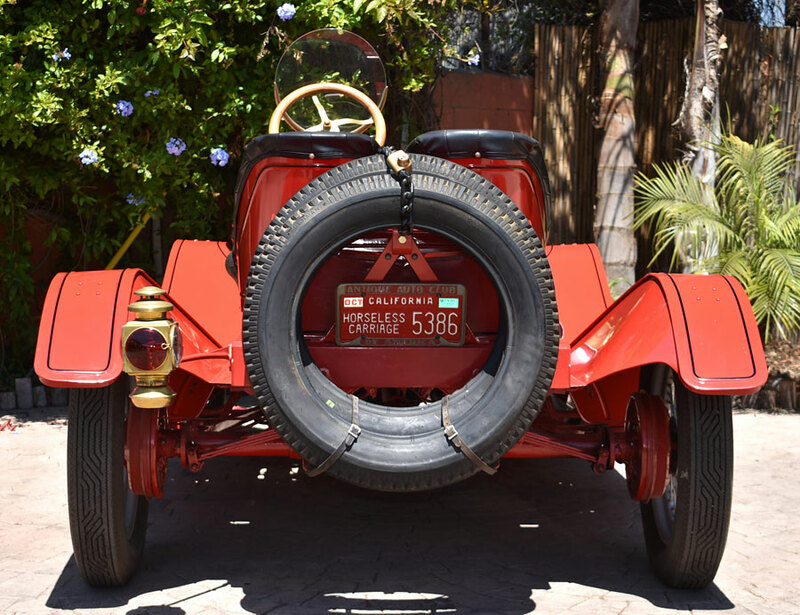 California Horseless Carriage plate 5386 is assigned to the car and both plates are included in the sale. Note dual spares with -- you've guessed it -- brass lock! 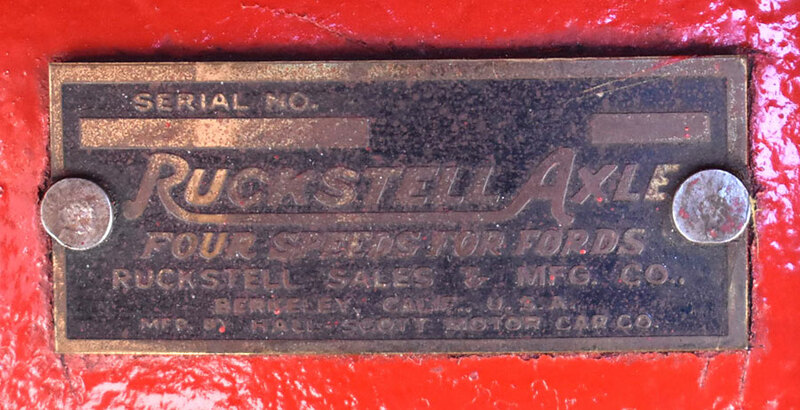 "Four Speeds for Fords" was Ruckstell's slogan. 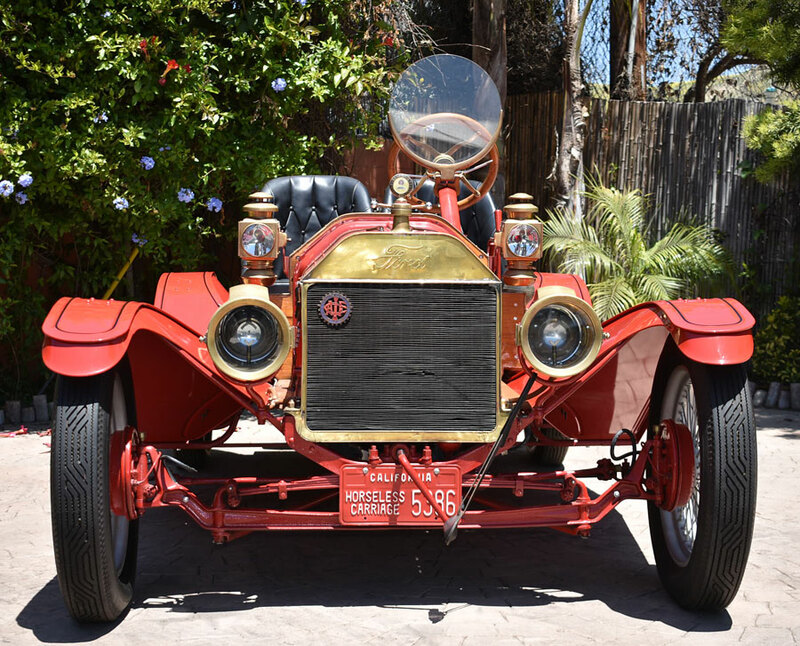 Their 2-speed rear end effectively turned the original 2-speed Ford into a 4-speed car. 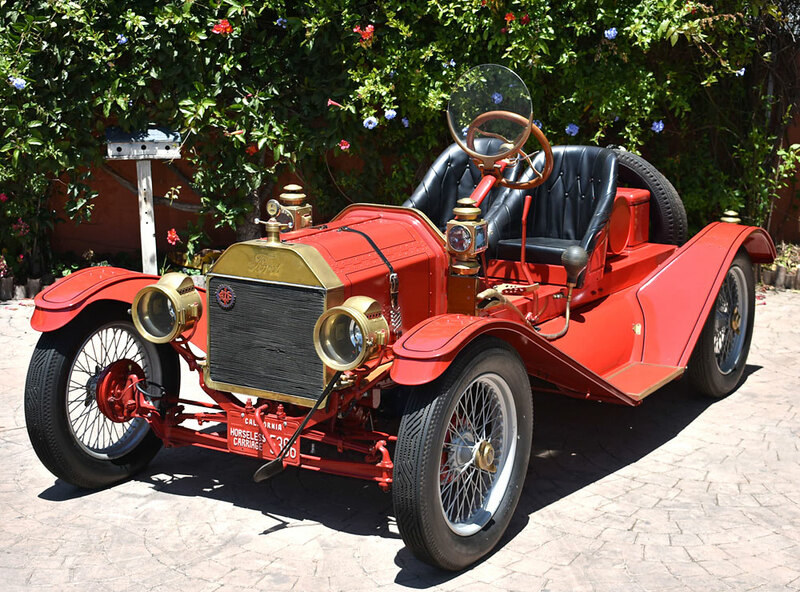 We've driven pretty much everything that has wheels, from microcars to supercars, but we can state with a straight face that few cars provide more excitement than a Model T Speedster. It's driving in its purest form and you can park it next to a Ferrari, and be still the center of attention anywhere! We sold this Speedster in May of 2018.